Cincinnati : Keckeler, 1869 [2nd ed.] ; cincinnati : H. W. Derby, 1856 [1st ed.]. Description : (2) l. port., [i-ii], i-viii, 246 pp. ; ill., (2) port. front., 23 cm. 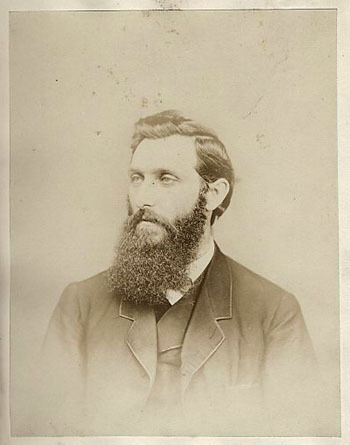 Photograph: mounted albumen portrait of the editor, A. T. Keckeler. Note: The photograph of Keckeler is captioned, "BILIOUS SANGUINE". The Editors being, by the will of Professor Powell, placed in possession of his unpublished manuscripts and his phrenological cabinet of crania, and illustrations—having been delegated by him as his successors, after a most thorough course of his personal instruction, with his Diploma of "competency to teach and practice the Science," will, as far as may be consistent with other duties, endeavor to fill his place as teachers to those who may desire a more extended instruction than the necessarily limited illustrations of this work can offer. The cabinet of crania cited by the Keckelers was Powell's collection of over 500 skulls, second in importance only to the collection of the more learned Dr. Samuel G. Morton, father of American physical anthropology. Combe continues with an analysis of the child's character appertaining to the phrenologic regions exposed by the wound and although we now know his conclusions were wrong, this is one of the first direct observations in the difficult science of regional brain function. By the 1850's Phrenology debased into a popular science in spite of the efforts of Caldwell, John Bell, Combe and others and books like Powell's proliferated. Powell even took to marriage counseling, soliciting daguerrotypes from prospective couples for a reading of their compatibility. There is a chapter on marriage in the book as well as chapters on crime and, his specialty, a supposed measurement of vitality. However the greater portion of the book is given to the usual woodcut illustrations of famous personalities with commentary on the bumps of their heads. Powell is particularly flattering of Dr. Edward H. Dixon, publisher of The New York Scalpel and includes a long biography extracted from the Phrenological Journal. It is rare to find a phrenological text illustrated by photography. By the time photos began to appear in medical books, phrenology had debased into a popular science and it is easier to fudge the facts with an artist's line drawing. The image of Keckeler which represents the "bilious sanguine" type could easily represent any of the other types in the book. *For the rest of this passage and more information on phrenology I highly recommend Dr. John van Wyhe's site, The History of Phrenology on the Web, which provides links to numerous txt and rtf files of historical texts.